Lord a'mighty, feel his temperature rise! This crazy Kat has chosen to do an impersonation of Keanu Reeves in the middle of a desert. That's wrong on many levels. Note the classic 'Jesus' pose favoured by many a full-length Goth, accentuating their sacrifice - they have suffered so that we may giggle. You should see how hot he is in person! I think he's almost got the Pinhead from Hellraiser outfit going on. Damn, he's got to be sweating! That's more of a Cenobite (Hellraiser) outfit than a Matrix one, I think. Nice photo, quite nice looking model, interesting skirt. But, is that brown trainers that I spot!? Nah those are boots, just covered in dust from the desert. 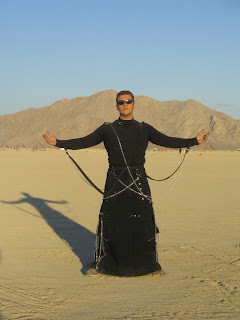 I actually either met him, or someone dressed similar as him last (2008) burning man. I asked if he was hot, he said he wasn't, and he was use to it. I on the other hand, melted into a puddle of fleshy ooze every day at mid day from the heat. Holy crap! I know that guy! Yes, Kat is that hot in person. No, he doesn't sweat. Hot wasn't where I was going with it. The first thing to come to my mind was "douche goth". What majesty. I went to Giza...it was a transporting experience. Now, looking at this pic, I know what that dessicated black husk at the foot of the pyramid was...(goth missing the point...its not about you).